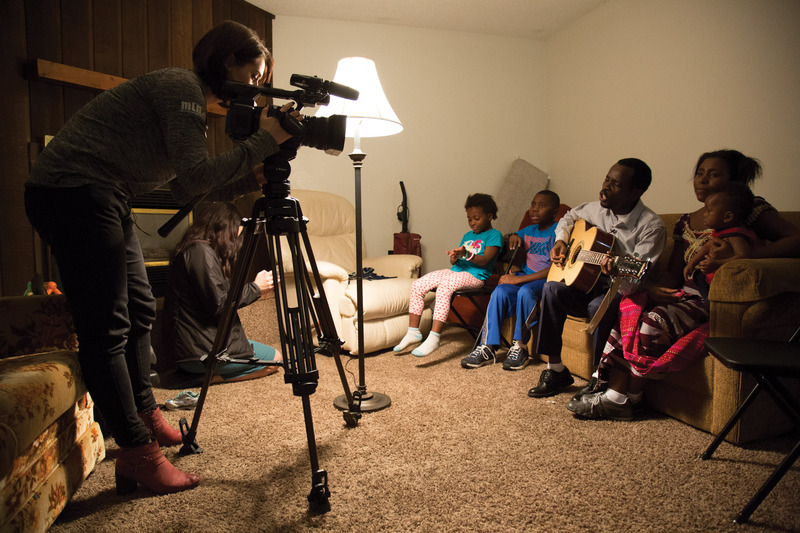 Augusta McDonnell, a news reporter for KPAX-TV, films Joel Makeci and Abwe Bikyeombe as they sing with their children, at the end of her interview with the family. As millions of refugees fled their countries in search of asylum, images of violence and despair filled newspaper pages, online news sites and social media feeds. They showed a child facedown on a beach after drowning in the Mediterranean Sea. They showed a man with an automatic rifle, only his eyes visible beneath his headscarf, set against a blood-red background on a political flier. They showed people in airports with welcome signs. Masses in boats. Mug shots of terrorists. These stories touched people around the world, prompting compassion in some and fear in others. They played out in Idaho, which has successfully resettled refugees for decades, and in Montana, which hadn’t seen a significant influx of refugees since the 1990s. When Soft Landing Missoula, a citizen’s initiative in Montana’s liberal university town, lobbied for a program to bring in 150 refugees, the story became local. Soft Landing’s proposal pitted supporters against skeptics suspicious of these foreigners. Reporters struggled to balance a topic driven by outside forces, strong emotions and deep-seated stereotypes. They hoped for the human story to emerge. However, when Missoula’s first refugees arrived, local journalists kept their distance. For eight weeks, the refugees who traveled across the world to make a new life in Montana remained invisible in the media. They were there, but in a way, they weren’t there at all. 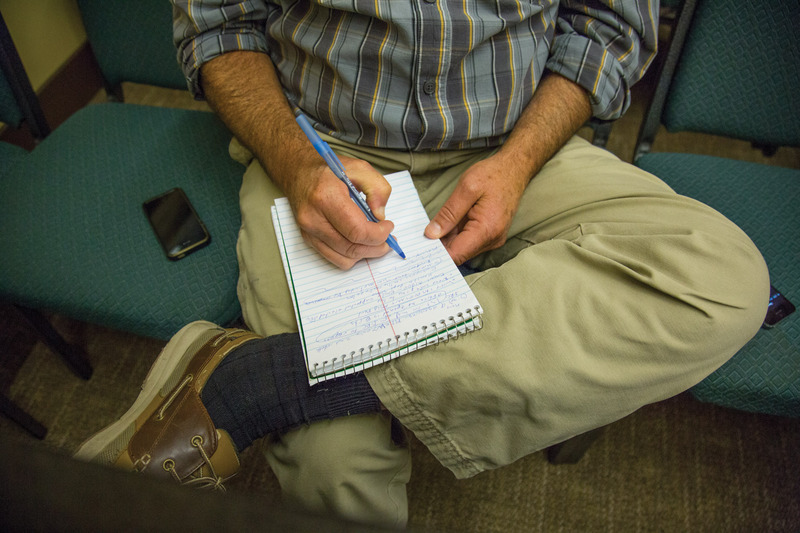 Kim Briggeman of the Missoulian newspaper takes notes at the Central Committee’s meeting about the welcoming of refugees to Missoula. Molly Short Carr, left, Missoula’s new International Rescue Committee director and Mary Poole, right, the founder of Soft Landing Missoula, speak at the Central Committee meeting in the Missoula City Council chambers. A nurse, arborist, jewelry-maker and mom, Mary Poole took notice when the photo of a drowned refugee child went viral in 2015. In her mind, she saw her own toddler facedown on that beach and felt compelled to take action. She thought she could help by bringing some refugees to her hometown, Missoula. The story of Poole’s epiphany and subsequent founding of Soft Landing Missoula traveled across the nation and the world. 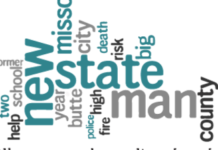 Major news organizations sent reporters fascinated by the big red state’s little blue city. 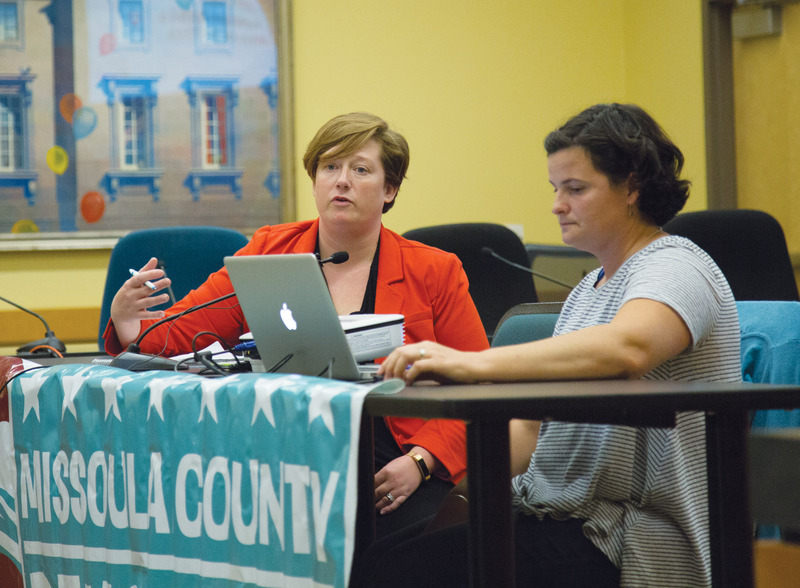 BBC videographer Matt Danzico interviewed Poole during the summer of 2016 for a five-minute story, along with Ravalli County Commissioner Jeff Burrows and Wilmot Collins, a Liberian refugee living in Helena. All shared why they either supported or opposed the possibility of refugees coming to western Montana. Many resettlement programs are urban. Programs in rural, overwhelmingly white places away from the coasts often get overlooked, the BBC reporter said. He wanted to report on Missoula’s refugee resettlement because it was an important side of the story not being told. “Missoula is an interesting, practical example of what happens when refugees get into the American heartland,” Danzico said. The Associated Press wrote about Missoula as part of a series titled Divided America. Ellen Wulfhorst of Reuters took a human-interest approach, telling the story of the Hmong refugees from Southeast Asia who were resettled in Missoula in the 1980s. Al-Jazeera featured the resettlement process right after the City Council voted to become an official welcoming city to refugees. Montana historically leans Republican in presidential elections, but on a city-by-city basis, the bag is a bit more mixed. In the midst of campaign season, the clash of political views added another layer to an already complex conversation. On Aug. 19, 2016, the Missoulian newspaper’s front-page headline read, “Refugees: Gianforte condemns resettlement.” A second headline, in the sidebar, said, “Congolese refugees arrive in Missoula.” No images accompanied the print stories. The first refugee family had landed, and no photographer was there to capture it. If turnout for public rallies is an indicator, local community support for Soft Landing’s initiative to welcome refugees was strong. In the city of Missoula, up to a thousand citizens joined a “March Against Hate” in February 2016, while participants in anti-refugee demonstrations typically counted no more than 100. However, in nearby Ravalli County, around 500 skeptics attended a public hearing to voice their fear of, and resistance to, an influx of refugees from the Middle East. Op-ed pieces and letters to the editor present an alternative for people who believe that journalists do not adequately represent their point of view. From April to September 2016, the Missoulian published more than 30 such pieces on the refugee issue. In fact, over that time period, the paper printed more opinion articles and letters to the editor than news stories related to refugee resettlement. In response to Islamophobic statements, McDonnell aired a piece about Muslims living in Missoula and how they felt about calls for specific Muslim-based immigration policies. 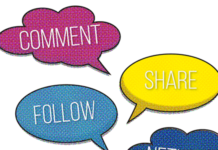 Online editors at KPAX-TV spent the morning after the story was posted online deleting vulgar and hateful Facebook comments. Augusta McDonnell, a reporter for KPAX-TV, explains how her experiences working as a reporter in Israel will inform her coverage on the refugee families arriving in Missoula over the next few months. 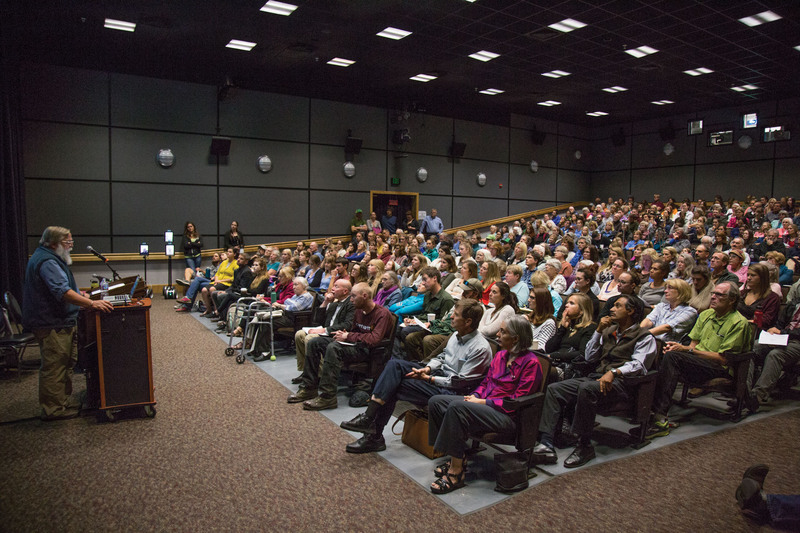 Paul Robinson speaks to a full University Center Theater at the first lecture of the “Conflict, Poverty, and Identity in the Democratic Republic of Congo” series. The series was launched by Soft Landing Missoula. Reporting nuances can be difficult when everyone has an opinion, regardless of how much they know about the matter at hand. Take the gruesome story that made its rounds in Idaho during the summer of 2016: It alleged that three young boys had raped a 5-year-old girl at knifepoint in a Twin Falls apartment complex, the oldest recording the crime on his cellphone. Conspiracy websites and anti-Muslim blogs claimed the perpetrators were Syrian refugees. Because the kids involved were minors, the case was sealed. The Times-News in Twin Falls only wrote about it when prosecutors went public to set the record straight. The boys, it emerged, weren’t from Syria but from Sudan and Iraq. They did not wield a knife, and the girl was sexually assaulted but not raped. The paper followed up with stories about death threats against City Council members and the boys’ families being evicted from their apartment complex. Still, anti-refugee groups continued accusing authorities of a cover-up. The story shook a state whose role in refugee resettlement is often cited as a success. More than a decade ago, the federal government identified Boise and Twin Falls as good resettlement sites because the communities are large enough to provide services but not overwhelmingly large. Idaho has three nonprofit resettlement offices, including the International Rescue Committee in Boise and a state office located at the College of Southern Idaho that oversees all refugee arrivals. In 2016, Boise’s Idaho Statesman, the largest print publication in the state, created a beat dedicated solely to refugee news. 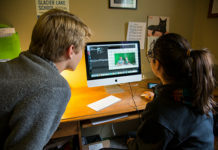 Its reporter, Zach Kyle, investigated whether refugees get better jobs as they become more integrated and wrote a feature about a refugee who was reunited with his family. Nathan Brown, the political reporter for the Times-News in Twin Falls, has covered the issue through a political lens. One of his first stories detailed Tea Party member Rick Martin’s ballot initiative to oppose resettlement in Idaho. Martin needed 3,800 signatures to get the issue on the ballot but collected 900. Brown said the opposition was so loud because the national political climate made them feel more comfortable voicing their opinions. He said this meant the media’s voice needed to be louder too. “If the people are concerned and it is an election issue, like refugee resettlement, then the media should cover it more aggressively,” he said. Over the years, refugees have become a significant part of the Boise and Twin Falls communities. Times-News religion and culture editor Tetona Dunlap followed a refugee family for a year. In an update for readers, she described how the project took her outside of her comfort zone. 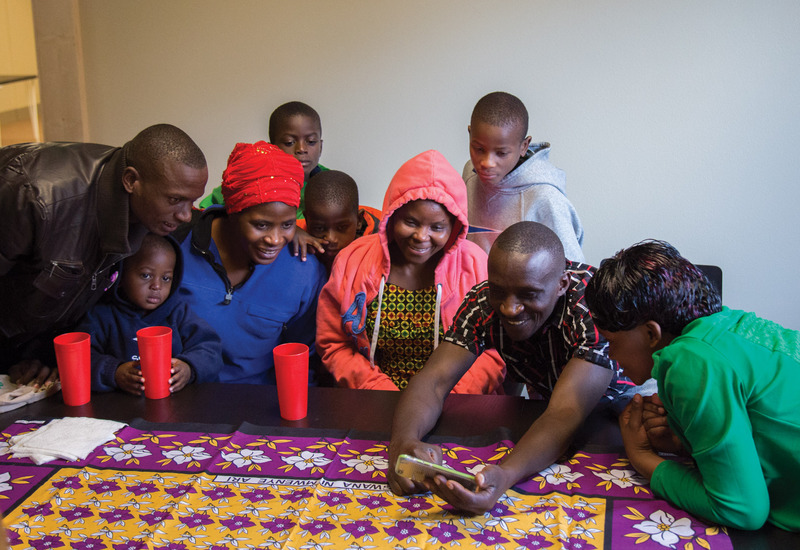 Gilbert Hategeka, left, Chantal Nyiramanza, center left, Vani Nyiraburanga, center right, and Joseph Bazungu, right, and their children watch a video of Hategeka and Nyiramanza’s family arriving in Missoula. The video also documented their first experience with automatic sliding doors. On a cold September night, Missoulian reporter Kim Briggeman stood in a parking lot looking through notes and handouts from a training session he just sat in on. His lower jaw inched out as he went over what he knew, what he didn’t and how he would tell it to the public. Briggeman began reporting on the refugee crisis when Soft Landing Missoula first proposed re-opening the city’s resettlement office in 2015. Both Soft Landing founder Mary Poole and the new director of Missoula’s International Rescue Committee office, Molly Short Carr, were important sources as the city got ready to accommodate the first group of refugees. Between April and September 2016, every other reported story about resettlement in the Missoulian quoted at least one of them. Briggeman and other reporters in Missoula knew the public wanted to learn more about their new neighbors. “We all have so many questions, and, yes, there are things we don’t need to tell,” he said, “but it’d be nice to know their living conditions, where they’re going to school and their religion.” Yet in a volunteer training session, Short Carr mentioned her fear of disclosing names, ages and other specific information because it could put the refugees at risk. Poole and Short Carr had become the refugees’ gatekeepers. The IRC controlled the flow of information, and local journalists tread lightly for fear of losing access. Briggeman said the refugees weren’t going anywhere and that resettlement was a long-term story. It wasn’t that reporters didn’t want to meet the families; it was a matter of timing. But did it make sense to wait so long? It didn’t to Ann Cooper, a former international correspondent who now teaches at Columbia University. Cooper said in rural communities, where both citizens and refugees may be wary of resettlement, meeting the families and reporting on what they’ve gone through and are going through is what can help create better understanding. The Idaho resettlement agency was more forthcoming, according to Zach Kyle. But Kyle also built a source network beyond the gatekeepers. Missoulian photographer Tommy Martino photographs two of the five Congolese refugee families who have arrived in Missoula since August 2016. This interaction outside the International Rescue Committee office was the first time any local media outlet had access to the refugees. Amy Frykholm scanned the Sunday morning crowd at Missoula Alliance Church, looking for a family she’d never met before. No luck. She started to leave until she saw them: the Congolese refugee family. A tall white woman led five African children and their mother to seats in the front row. Frykholm watched the children climb over the seats and reach out to churchgoers around them. After the service, she watched a man in a shiny, bright blue suit sit down next to a woman she assumed was his wife, pink hair peeking out from beneath her headdress. Frykholm introduced herself as a reporter from Christian Century Magazine based out of Chicago, explained that she was writing a story about refugees that would reach about 30,000 subscribers, and asked if she could spend time with them in their home. “I kept checking for a lack of comfort, but they were so open to publicity and comfortable being in public,” Frykholm said. Three days, two families, one multimedia package. Frykholm and her photographer, University of Montana journalism professor Jeremy Lurgio, were the first two journalists to meet some of Missoula’s newest refugees. While the reporters did not have permission from Short Carr to contact the families, they didn’t have her disapproval either. Frykholm emailed her, called her and left a card at the IRC office. She didn’t get a response until she was in one of the refugee families’ homes. At that point, a volunteer showed up and told Frykholm to call Short Carr about parameters for the interview. Frykholm was asked not to inquire about the refugees’ pasts or the services they’d received and to not push them if they became uncomfortable or unable to understand. Frykholm said it was much easier for her to circumvent the gatekeepers because she’s from out of state. As a local reporter, she would have developed a relationship with Short Carr, as the local media had been doing, and volunteered to build a relationship with the refugees. She would also have continually stressed the importance of sharing their new day-to-day life with the public. 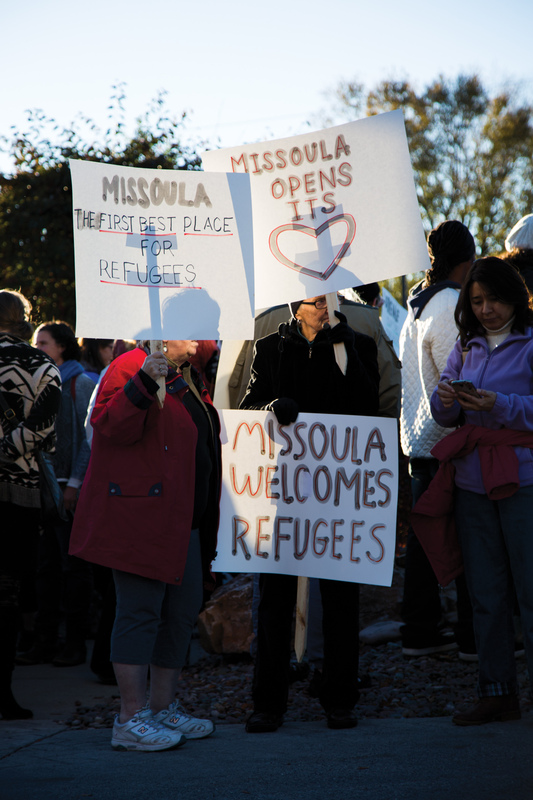 Margaret Scott, left, and Gerry Blackman hold signs welcoming refugees to Missoula. It wasn’t until October 2016 that Briggeman finally received a call from Poole. Short Carr had lined up two families for the Missoulian to talk to. At the interview in a small room at the IRC office, a translator bridged the gap between English and Swahili. The five Congolese seemed comfortable and animated. One of them told Briggeman a funny story about struggling to figure out what to do when the heater in their new place didn’t work. 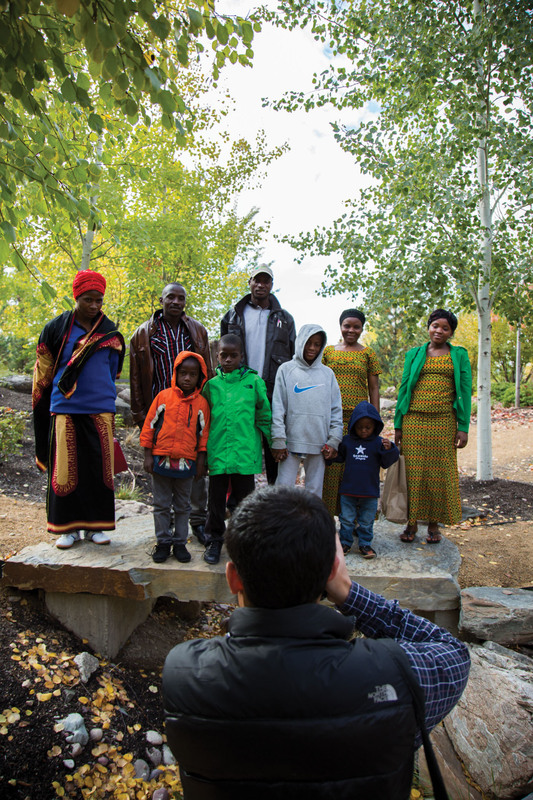 The next day, about two months after the first families had arrived, the Missoulian’s front page headline read, “Congolese refugees: Sharing their joys, foibles, discoveries.” Beneath it, a smaller headline said, “Pastor speaks out against Islam.” Above the fold, a large photo showed a Congolese man and woman smiling. The refugees finally had names and faces, and the Missoula community was able to learn from the media who they were. Maddie Vincent is a journalism graduate student at the University of Montana. Ask her how she feels about the refugee resettlement issue and she’ll probably cry, scream, smile and then tell you it’s the issue that deepened her love for investigative storytelling.